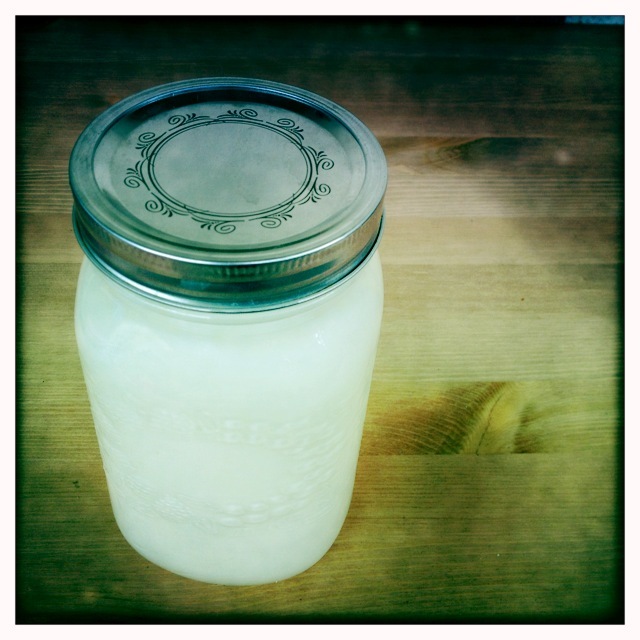 For the last few years I’ve been making my own yogurt. It’s really easy to do, it is way cheaper than buying yogurt (1L of yogurt for the cost of a litre of milk), and it tastes amazing. I eat it for breakfast most mornings, but I also use it to make yogurt cheese, dips, and as an ingredient in many recipes like this, this, this and this. I also eat a lot of yogurt as a source of calcium, because as a person who is lactose intolerant I am always trying to include calcium rich foods in my diet. The culturing process eats up most of the lactose, so it doesn’t hurt me. The brand of my yogurt maker is Deni, and I like it because it’s the perfect size for a quart canning jar. I just took out the little jars and insert that came with the machine, and make it in the big jar – fewer jars to wash up! 1. Heat the milk in a pot, stirring to avoid scorching. Heat until just before it boils (110F if you want to be exact). 2. Let the milk cool to room temperature. 3. Mix a little of the cooled milk into the yogurt, then add a little more milk, stir it in, then mix all the rest together. 5. Refrigerate the yogurt to stop the process. You can eat it a few hours later. I like to just cut up some fruit and put it in a bowl with the yogurt – a delicious and healthy breakfast or snack! Thank you, Kim! I’ve meant to email you about this, as its been something I’ve intended to start trying. One of my goals for the year is to start reducing my plastic usage and gosh, yogurt is a big thing in our house so a good place to start. Besides, all the sugar that’s added into even the better brands of yogurt really stinks. With a birthday coming up, I think I’ll request a Deni. Along with a bike pump, since all the gas stations I’ve encountered here in Winnipeg make you pay $1 for air :). I got my yogurt maker at Home Hardware – they don’t all carry it, so you can check online (or somebody who wants to buy you one can), or call & order one. Crazy about the charging for air! I’ve never heard of that before!